Filling the Ready To Go Information Technologies Honda Civic GX for our trip to Blog World & New Media Expo. It's a natural gas car and again the cleanest internal-combustion vehicle in the world according to the EPA. This year we made it to Barstow from the Sand Canyon fill station in Irvine with no problem, AC Blasting, keeping up with the flow. Year two to Blog World powered on compressed natural gas to find that Ford was on site with a booth and a ride with the most beautiful black paint job I have ever seen. I made sure to stop in and thank them for not taking money in the bail out. I also begged them to make a CNG anything! We would buy it, that and a home fueling station! ( What happened to the Phill website??) Boone you buy it? Sharing is good, Lisa calls me Ferris, Chris would prolly back her up on that. As long as I can rememeber I have felt the lure of great music and cool tools. I seem to find myself at a place, look around and wonder, WHERE IS EVERYONE? The next thing I think is WOW I GOTTA SHARE THIS! The internet has speed up the process and now it is a skill set to be a trend spotter and be able to catch the next wave before most of the other surfers have even noted the swell on the horizon. Luck or skill? Perhaps a bit of both, but it sure is a long string of serendipitous events that brought me to buy a CNG auto prior to the being of Gulf War V.2, Natural gas being 62 cents a gallon to fill at the time. Imagine the ribbing I took from friends and colleagues when I bought my that first GX, that "PROPAIN" Car, that "BBQ" mobile. It did not matter that driven through Los Angeles it was actualy cleaning the air or that the fuel was home grown and plentiful. 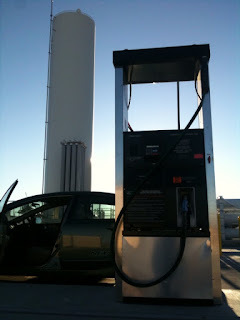 Years later, I am in my Second GX, and now when I pull into the service station to fill the tires, or wash the windows, not one, not two but sometimes as many as three people want to know where I got it, what I paid for it, where they can get one and why don't they hear more about CNG on the news. I give them the low down on the GX and then let them know when the time comes and Ella is driving and we are living in the Hydrogen age, it will only take a chip change out to move the GX from CNG to Hydrogen. Enter the Pickens Plan, T-Boone Picken's idea to use wind power and natural gas to wean our nation off our dependence on foreign oil, now rated by our Pentagon to be a national security threat. I would personaly like to welcome T. Boone to the ranks of those taking action, jumping in alternative fuel automobiles and turning the course of this ship of state one tank at a time. If Not Us Who? If Not Now When? This is just the first step on our way to energy independence a clean safe world for our children and a happier healthy YOU!!! National Blog Posting Month for folks who want to get into the habit of blogging by doing it every day for a month, including weekends!